The KH-2 (Keyhole-2) was second version in the Corona-program to build an optical reconnaissance satellite. These satellites were all launched under the name Discoverer. 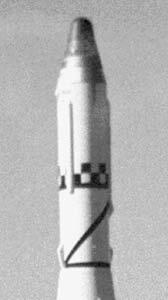 The KH-2 payload consisted of the improved C' (Corona prime) single panoramic camera and a single General Electric return vehicle (SRV, Satellite Return Vehicle). The improved and simplified C'-camera was built by the Fairchild Camera Co. and with a f/5.0 aperture and 61 cm focal length had a ground resolution of 10.7 m.
The satellite was based on the larger Agena-B upper stage, which provided attitude control in orbit. The film return capsule carried its own small solid-fuel retro motor to deorbit at the end of the mission with mid-air recovery of the returning capsule by a specially equipped aircraft. Ten KH-2 satellites were launched, of which four resulted in a successful return of film. Four missions failed to orbit. Discoverer 34 (KH-2 9) carried the Topsoc 4 (Aftrack 16) ELINT payload, the Vela Hotel Package 3 and a TR-17 type SECOR transponder.